Right now the S&P 500 is trading at 17.35 forward P/E that is higher than the historical average of 16.9. We don’t know how much the market has priced in the Fed loose money policy and or the expectations of the global growth in the future. We do know that the market is not cheap, the risk of a sudden correction is greater than the reward at the moment. After rising 81 trading days, the market somehow found reasons to have a sudden 6.8% selloff that pushed the S&P 500 1.45% below the 200-D moving average. Violation of 200-D moving average is considered bear market behavior. The market just got out of bear market in February 2016, four months later in June 2016 it tried really hard to shake people out of their bullish posture by going under 200-D moving average. If you thought the market was going down to re-visit the February 2016 low and liquidated your position, you just lost your position to the next immediate rise in the next weekly bullish cycle. This time will not be different. 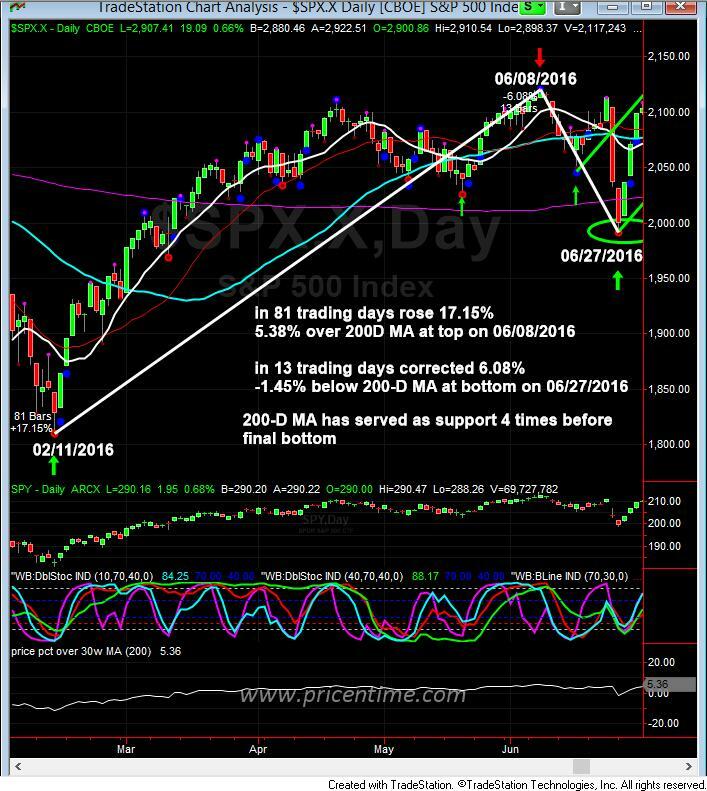 Once the top is made, you will find a sudden correction that will go under 200-D moving average. Right it is 5.36% over 200-D moving average and 74 trading days into the weekly cycle. 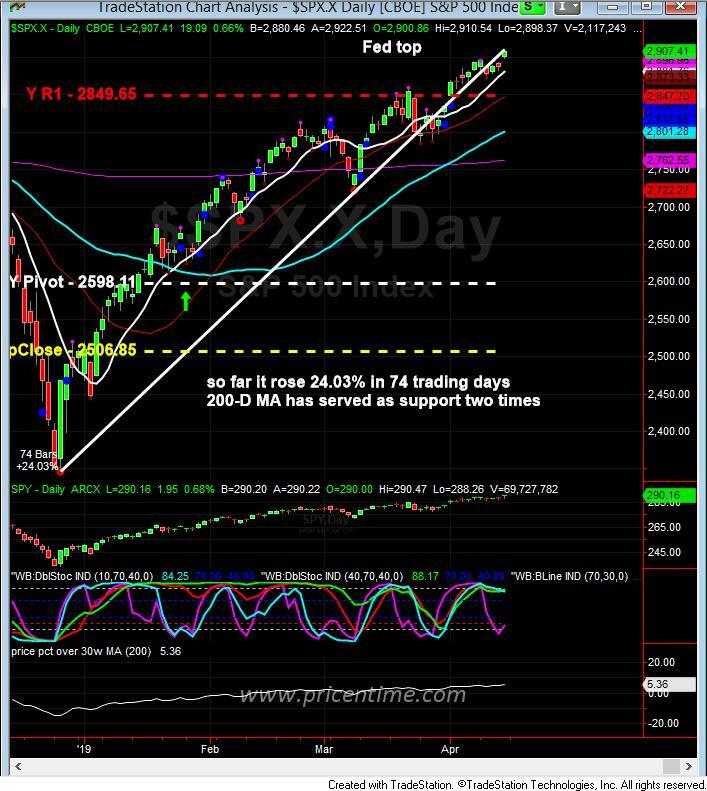 We are faithful that the market will find reasons to correct the valuation and produce a nice entry below 200-D moving average, although we can’t forecast the reasons why the market will self correct in the near future. With the confident in the 4-year cycle analysis, we will be buyers during the sudden panic selloff. The present 200-D moving average is 2762. 1% below 2762 is 2734. So anywhere around 2700 is a nice entry to enter the next new weekly cycle. Trump has been openly calling the Fed to cut rates and quantitative easing. Apparently Trump is fully into the idea of running the market high as 10% rise in S&P 500 corresponds to 1% rise in real GDP. Trump will not care what happens after the re-election as long as he gets re-elected. So we have a Trump put in the market. Buy all the dips until at least November 2020! This entry was posted	on Sunday, April 14th, 2019 at 7:15 pm	and is filed under Forecasts, Stock Indices. You can follow any responses to this entry through the RSS 2.0 feed. Both comments and pings are currently closed.